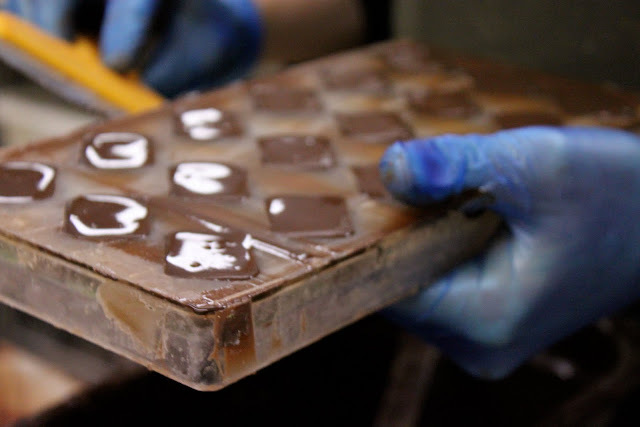 A few weeks ago I had a go at ‘tempering’ chocolate; trying to get a professional shine and smoothness of texture … when you break off a piece and it has a satisfyingly crisp ‘snap’ sound. I followed the instructions in Paul A Young‘s book ‘Adventures in Chocolate’, currently the world’s number one chocolate book which has won the Gourmand book award in Paris. 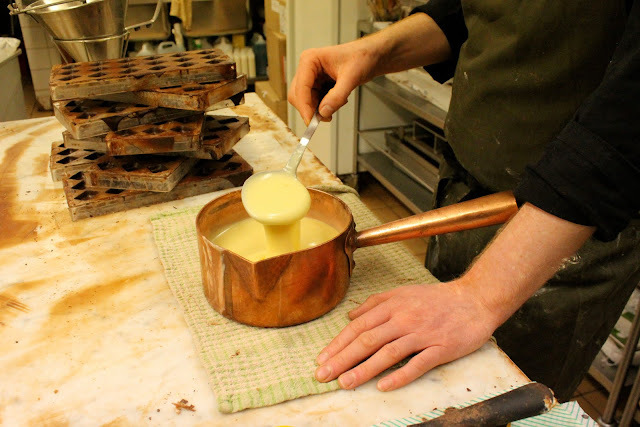 There are two methods of tempering; on a marble slab and ‘seeding’. 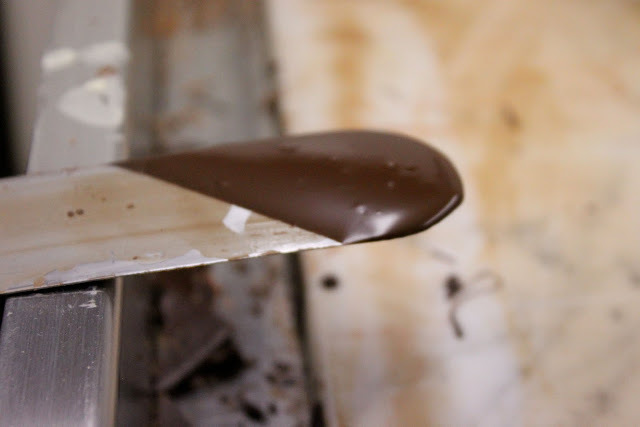 As I don’t possess a large marble slab, I tried ‘seeding’ which is introducing tempered chocolate to already melted chocolate and controlling the temperature so that it crystallises. Here is a great explanation of the science bit. 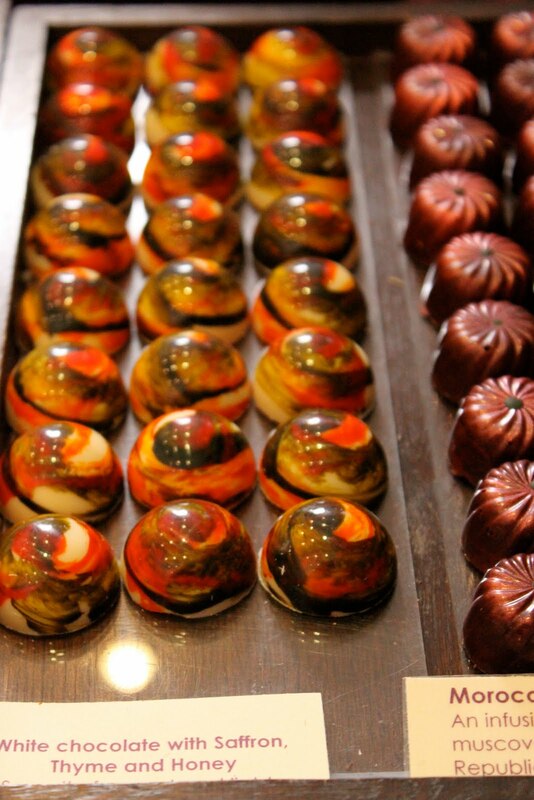 Although the tempered chocolates that I had made were ok, I realised that there is nothing like watching an expert to get a true idea of what to achieve. 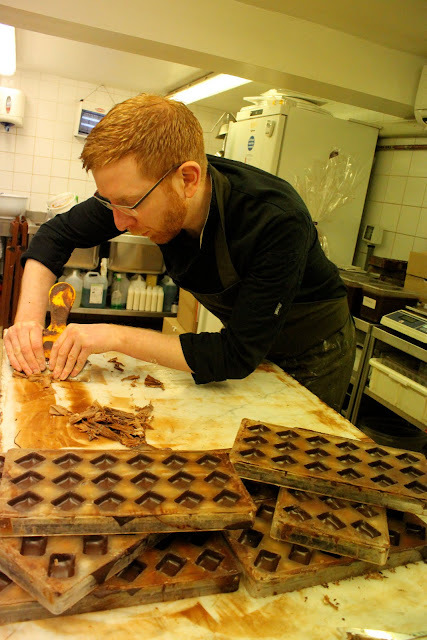 Paul kindly allowed me to come to the kitchen atelier of the Islington branch of his chocolaterie, to watch him temper a batch of chocolate. 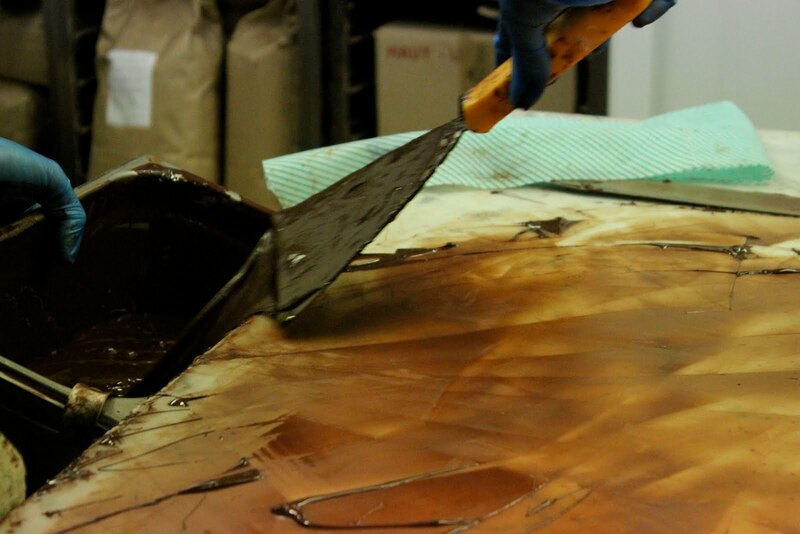 The kitchen is air-conditioned, you can’t temper chocolate in a warm place, and two large slabs of marble are positioned on island worktops. 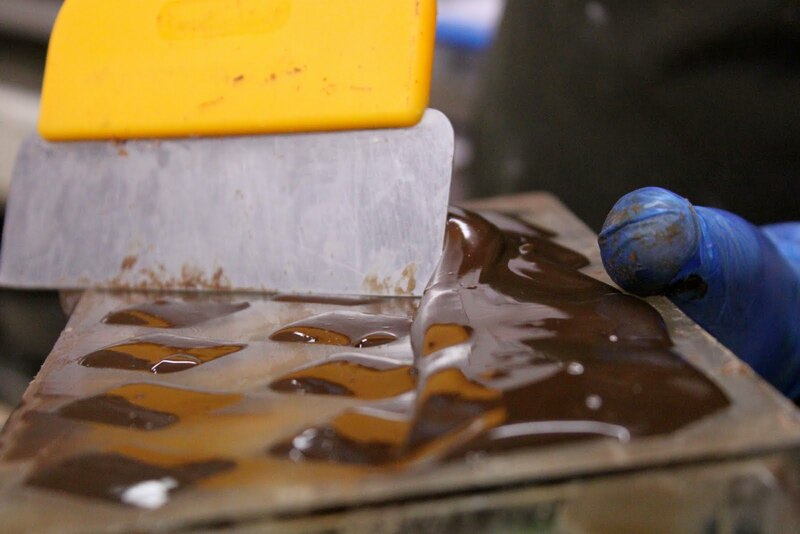 Shivering slightly, I watched Paul expertly and rapidly pour chocolate over the white marble and with practised movements, shift the chocolate around over the slab, using a palette knife and a metal scraper. 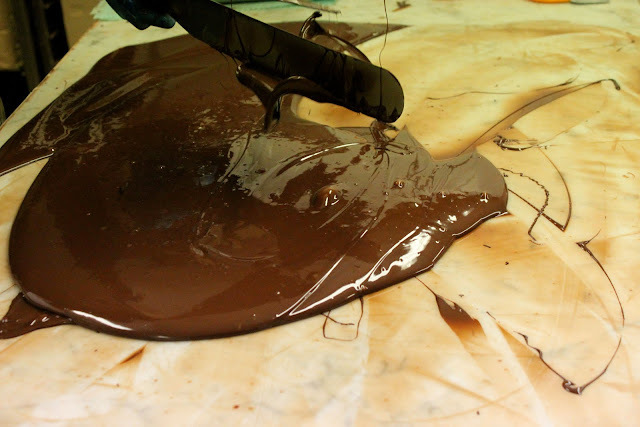 After about ten minutes, the chocolate became thicker and shinier. 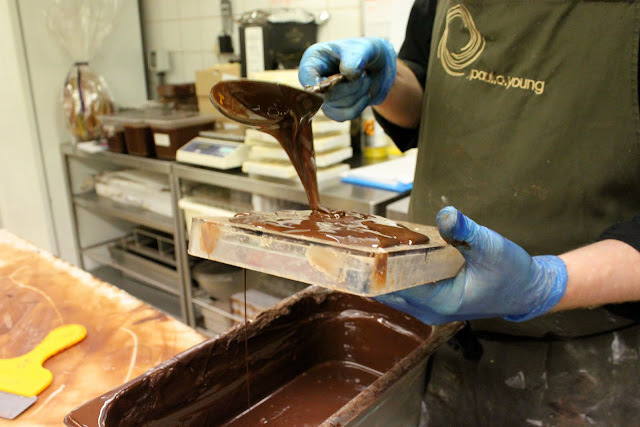 Paul dipped the end of his palette knife into the chocolate and let it dry while he scraped the rest into a metal bowl. 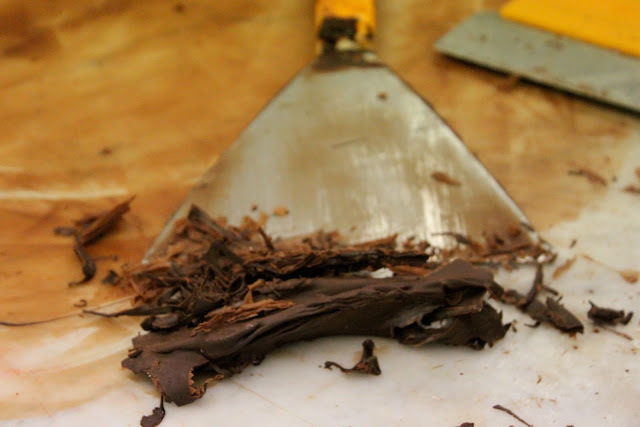 “this way it sets with a nice sheen, no graininess or grittiness”. 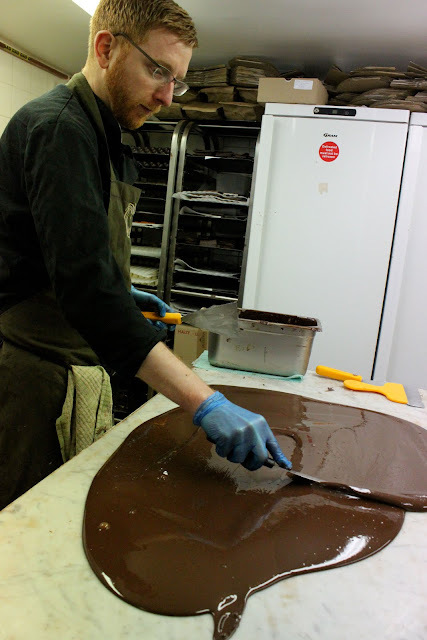 Brendan on the other side of the room was jumping from task to task, making salted caramel, icecream and brownies. 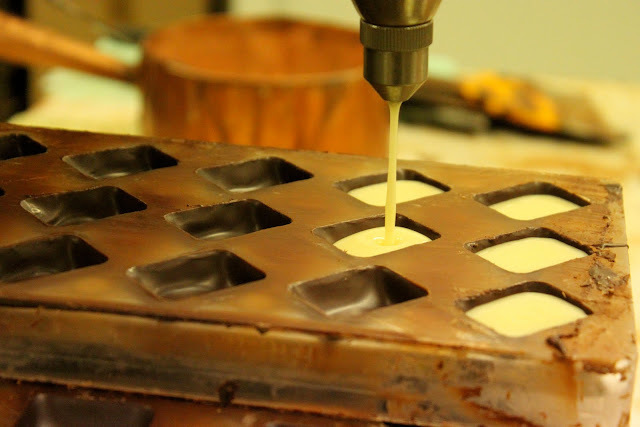 Both of them work very fast, today they will produce 2000 chocolates. 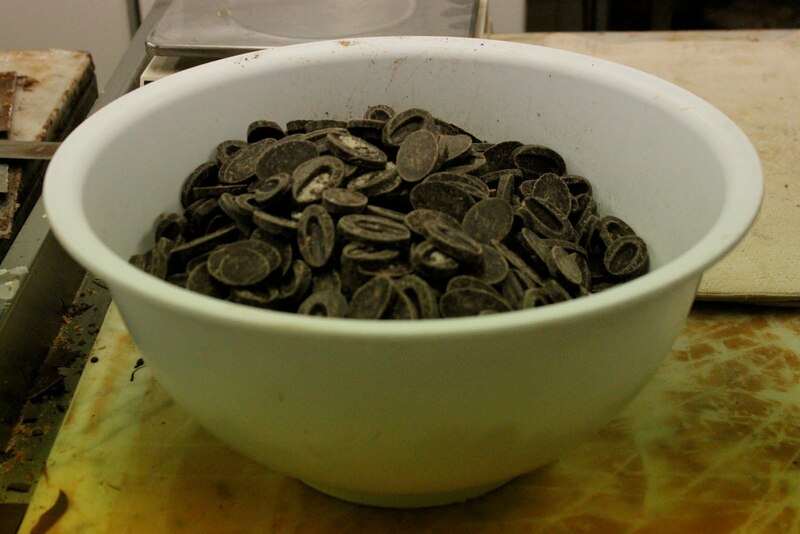 Coming up to Christmas the number is more like 20,000 chocolates a day. 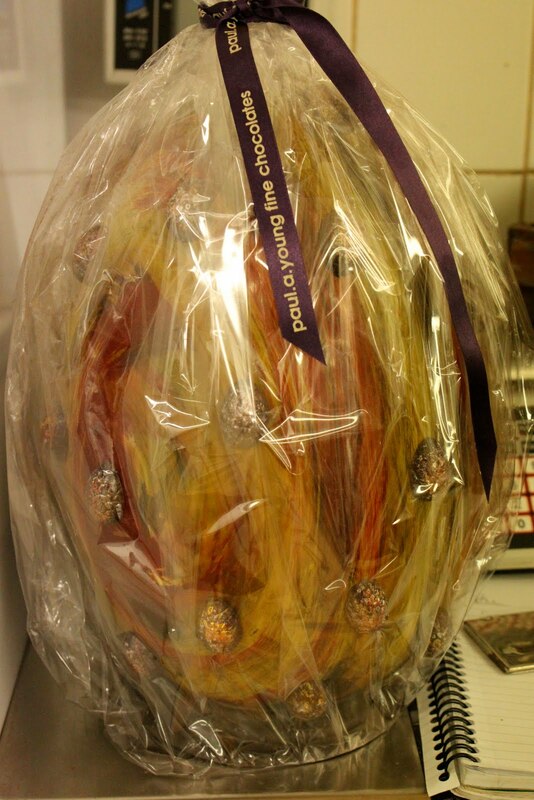 On the side stood an enormous cellophane wrapped Easter egg, in glorious colours, as if it had been painted roughly with expressionist brush strokes, ordered by a guy for his girlfriend. “Did the client design it?” I asked, looking at the sparkly mini eggs encrusted, fabergé style, into the surface. My childhood ambition was to work in a sweet shop. Just work in one, not even own it! Being in this workshop with it’s marble benches, was like winning the golden ticket for Willy Wonka’s chocolate factory. 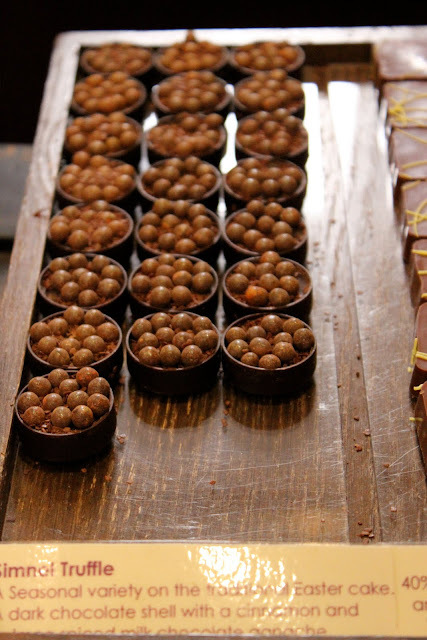 Shelves were crammed with tantalising bonbons, copper pots bubbled with white chocolate, goats cheese, rosemary and lemon ganache, ice cream machines whirred with thick gooey mixtures, diamond, circular and rectangular moulds, the familiar shapes of chocolate selections everywhere, casually piled up. 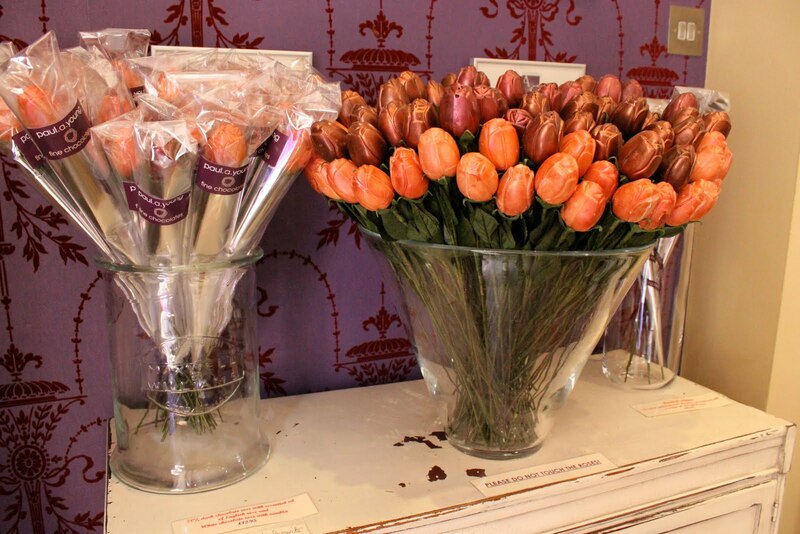 Christmas, Easter, Valentines, presents and treats, celebration, reminiscent in every corner. 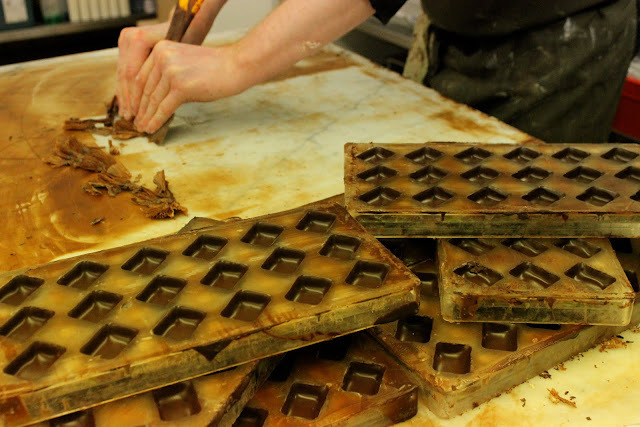 “Being around sweet stuff so much, we love savoury food,” said Brendan. Paul works so hard. Only this year has he started to give himself one day a week off. This is the reality of starting your own business, no love life, no time off. He has one week’s holiday a year. “Do you ever eat crap chocolate?” I ask Paul. 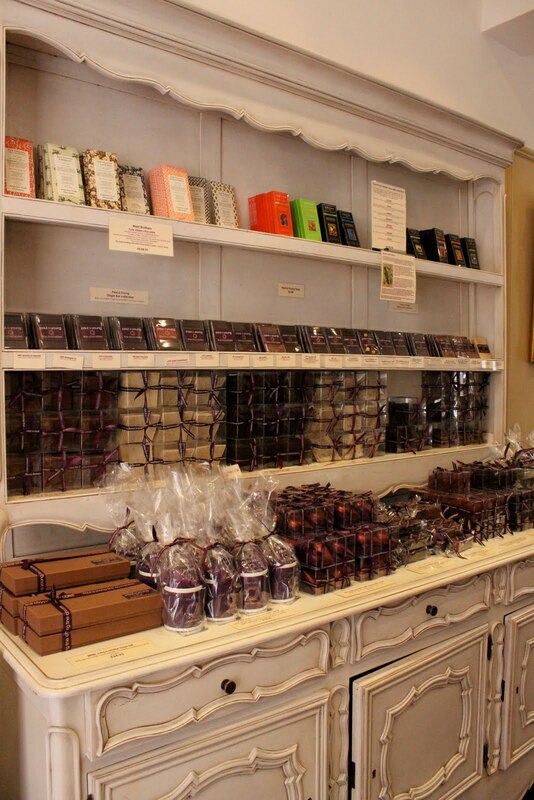 “I always keep a selection of my own chocolates in the glove compartment. I never eat trashy chocolate, there’s no enjoyment,” answered Paul. “Why chocolate? and what’s so good about your stuff as opposed to say, Thorntons?” I ask Paul. Did they have a conching machine? Nothing is done by machine! OMG … now its offical Ms M. that you have the best job in the world! Greetings from the US. Thanks for visiting my blog and leaving such a nice comment. To answer your question, the berries in the photo are actually "black raspberries". They're very small, and much different than blackberries. You can do a google search to see examples. Btw, I LOVE you blog!!! 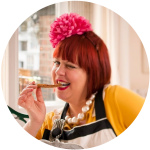 thankyou butter yum just discovered your blog and I love the step by step explanations…. I have to admit I'm a heathen when it comes to chocolate. Good ole Cadburys for me!